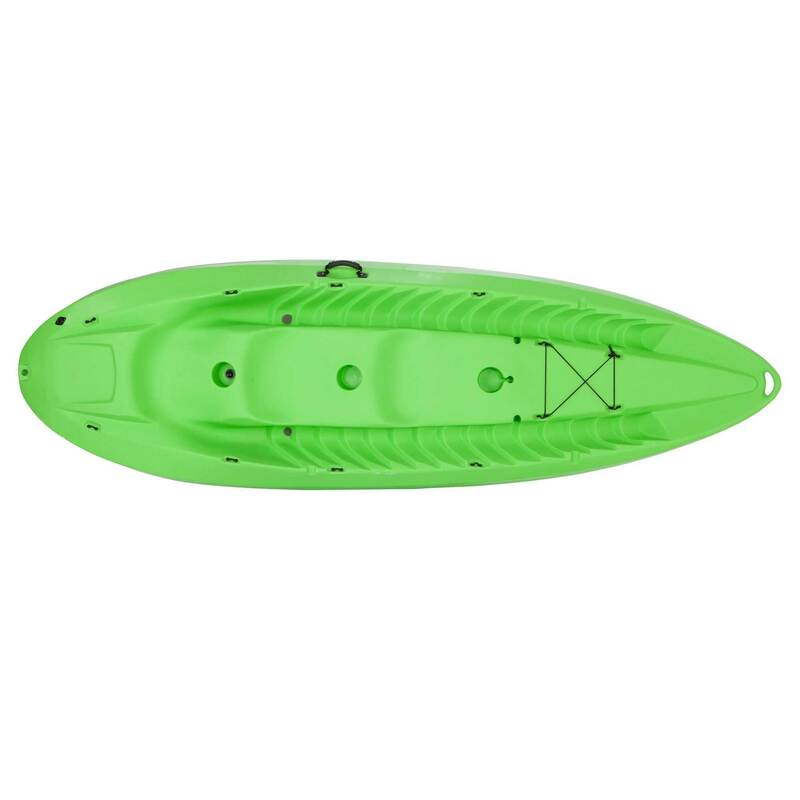 Lifetime Sit-on-Top Kayak - 10 ft. 90116 Manta Lime Color Tandem Kayak. 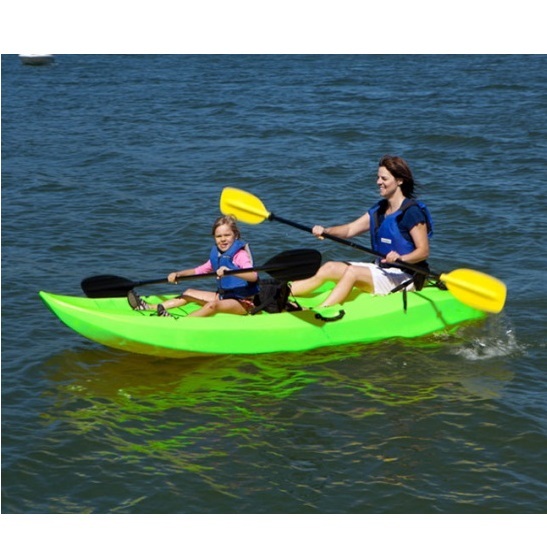 The 90116 tandem kayak features tandem seating and two padded backrests. 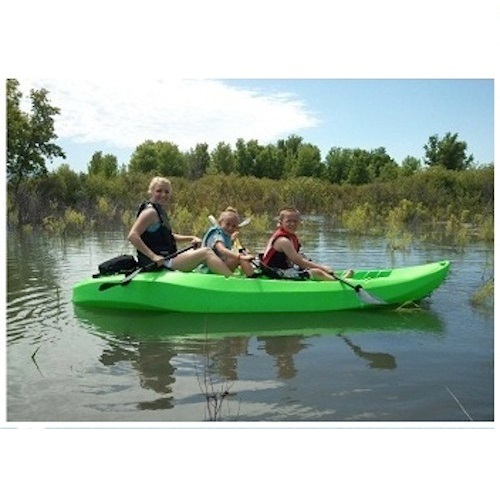 This Lifetime tandem kayak has seating for 3 persons with an overall weight limit of 500 lbs. 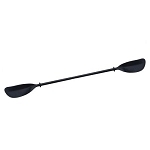 This kayak also features a mast-receiver for adding a sale. Lifetime kayaks have a wide base to help avoid tipping. Lifetime tandem kayaks are made of polyethylene plastic, which is UV treated and will not fade, crack, or peel in the sunlight like traditional plastics. 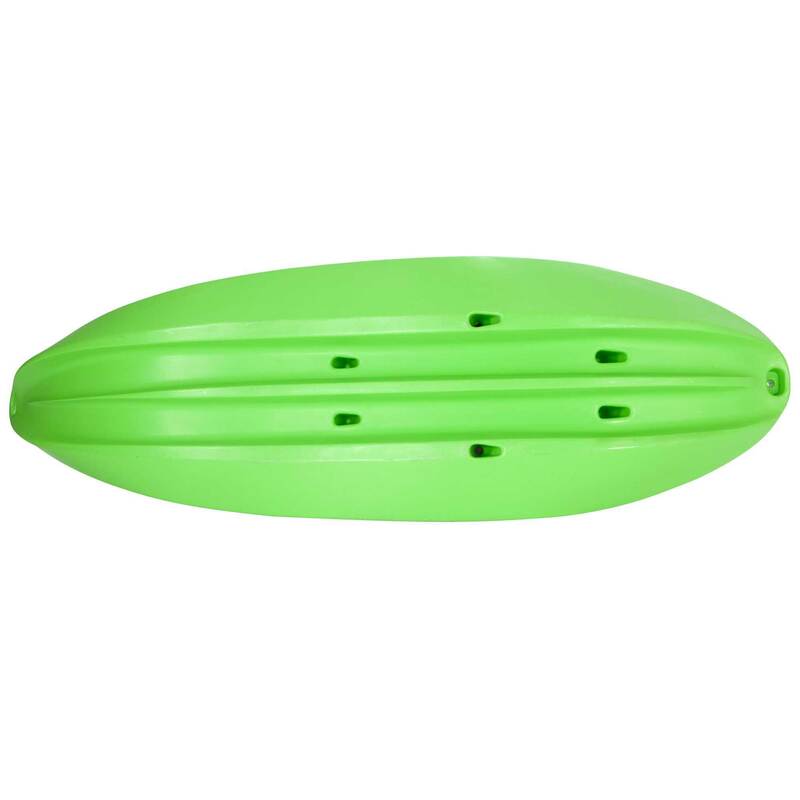 The 90116 lime tandem kayak comes with a 1-year factory warranty. Each kayak includes a unique identification number usually on the back of the kayak. Each kayak includes a manufacturer certificate of origin. Paddles for this sit-on-top kayak are sold separately. Lifetime Kayak length: 10 ft. Overall dimensions: 120 inches L x 36 inches W.
Tandem Kayak weight: 66 lbs. Weight limit capacity: 500 lbs. Product is shipped via an LTL freight carrier. Delivery for this product is a curbside delivery, which means the customer must be present to sign for the delivery and to help the driver unload the product. I have kayaked for 15 years. The Manta is my favorite! PROS: Made in US!The length is perfect for the roof of my Ford Escape, the accessories are durable, the features built into the kayak are plentiful. No product is 100% perfect but I'm rating this 5 stars because it has worked perfectly on all my kayak adventures without want or wear. I am 6'1 and 220 lbs and I comfortably fit 3 adults in my kayak (me included) without any fear of tipping. The 3-seat configuration is especially handy, and multiple footrests make restless legs a thing of the past. I also love the multiple seat back configurations - it's quick to change from solo to tandem and back. Molded features are beyond plentiful. Cup holders are large, scupper drains are thoughtfully placed, both the back and front easily carries cargo, and THE MOST CLEVER (BUT UNINTENDED) FEATURE is you can sunbathe comfortably in the prone position by putting your head at the front of the kayak! I also love the fishing rod insert, and did anybody notice the paddle inserts which double as strap guides when transporting the kayak? I did. CONS: The kayak drifts a little left-to-right because of the size and the bottom layout. A mild keel (maybe 2") down the middle for stability would solve that. The inevitable location of seat backs negate most lumbar support. The hull drain could be more thoughtfully placed - a little water is always left behind. Having only one side handle is pointless without the other. If the sail works with the Manta, I would be extremely happy. The motor mount seems expensive for such a simple function, as do the other motor accessories. The front paddle rest is impossible to use if you have forward cargo. Although aesthetically displeasing, it would be nice to have parallel paddle rests (or inserts) going the long way, as the paddles tend to unseat upon embark/disembark. CLOSING: Honestly, although I have some small cons, I am extremely happy with this product. I can't wait for version 2. 0! My husband and I go riding together in this and we love it! Its a great way to spend time together and its built with total quality. My Parents also use this and love it. This is awesome! I love the color and the double seats. The design is really nice. The sort of curve shape helps reduce drag and keep it afloat. This Kayak is very sturdy and quite difficult to fall out of. This Kayak is great for a couple. Our whole family loves our Manta. We have had two adults and a child on it with no issues. Great to transport, light enough to haul most places, but very durable. We use it regularly for general family fun and also for fishing. Two adults can easily fish from it. It handles nicely in various conditions and is stable on the water. I highly recommend this Kayak! This is an amazing kayak. We bought two of them for our family of 6 and these 10 footers do a great job. We can all kayak at the same time. I was surprised at how stable they are. We have never tipped or come close to tipping though I am sure its possible if you tried. Its a great upper body workout and the back rests are surprisingly comfortable. I would recommend paddle clips on the side to hold the paddles like the fishing kayak. Its light enough that I can get it out of the back of the truck and load it into the water myself. Another thing I love is that I do not get wet. We often go out in normal clothes - no swimming suits needed if you do not want to get wet. The gear strap in the front is handy and the water bottle holders are great for hot days. Way to go Lifetime for anther genius product for the family. My next door neighbor bought a some after he borrowed ours. Thank you Competitive Edge Products for the best price! Q: How well does this perform in the surf? A: The manufacturer recommends using these for flat water use; however I have seen them used successfully on beaches and choppy water. They are very stable, but you may have difficulty paddling in rougher water. Q: what size trolling motor works with the optional motor bracket? A: I personally have a 30 pound thrust motor and a 40 pound stress motor. I prefer the 30 pound thrust motor as it makes it more smooth. Q: What is the difference between the Lifetime Manta Kayak and this one? A: This is a manta, there are multiple different Manta Kayaks, The manta refers to the kayaks that have 2 seats. It does not come with paddles though like the yellow one does. The sport fishing kayaks are the same mold as this, but they have a cargo hold and paddle clips. Feel free to contact us with any other questions. A: No, it does not. The yellow model 90118 does come with paddles. You can select the option to add the paddles though. 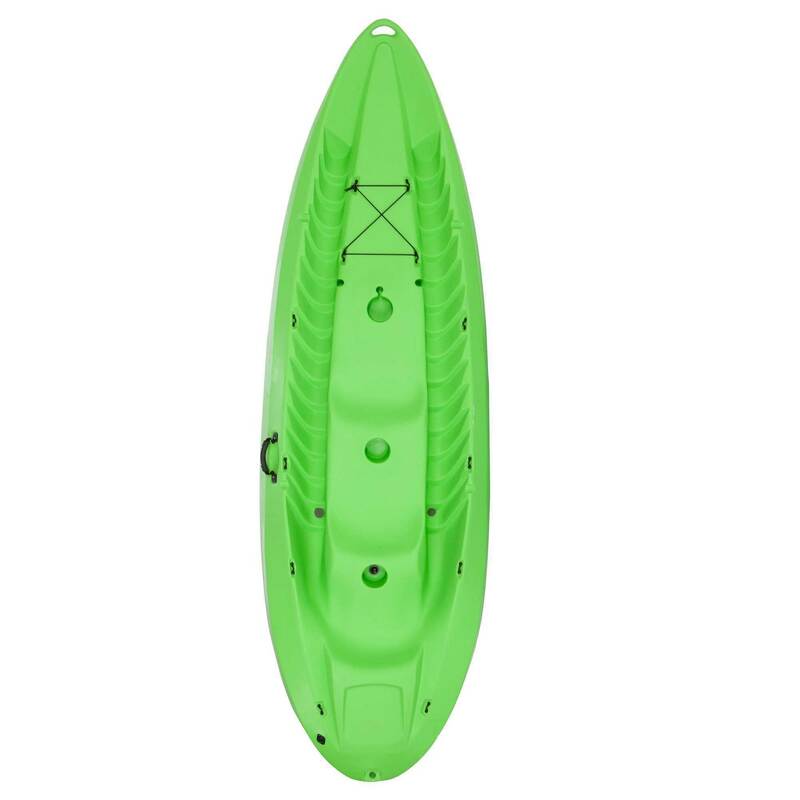 Q: Any differences between the green and yellow kayaks besides the colors? A: In the kayak design there is no difference. However, the yellow model that is similar does include paddles. In every other way they are identical. Q: Is the Lifetime Tandem available in stock? A: Yes, they are in stock. At least, they are in stock at the time of this answer which is on May 2, 2016. 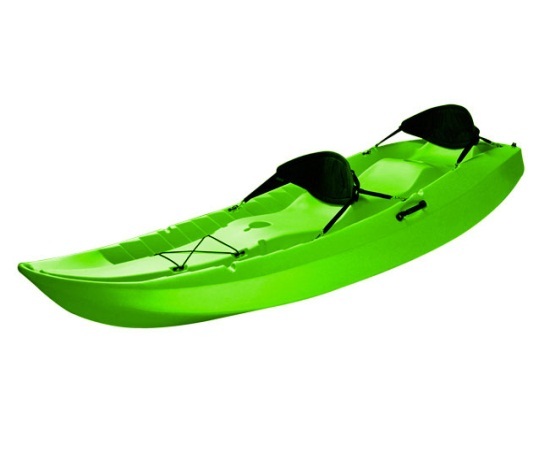 Shipping: Orders for the 90116 Lime Green Kayak generally leave the warehouse the next business day. Dimensions: 120" x 38" x 14"